Home > Banks and Insurance > Insurance Companies > Marsh & McLennan Companies, Inc. 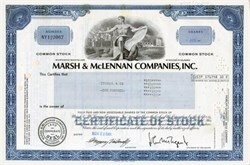 Beautifully engraved certificate from the Marsh & McLennan Companies, Inc. issued in 1980-1981. This historic document was printed by the American Banknote Company and has an ornate border around it with a vignette of an allegorical man holding a scroll in his outstretched arm. This item has the printed signatures of the Company�s President and Secretary and is over 20 years old. Marsh & McLennan is the world's largest insurance brokerage company. Following its purchase of UK broker Sedgwick Group, the firm began using subsidiary Marsh to hold its risk and insurance units, including Guy Carpenter & Co. (reinsurance); Seabury & Smith (insurance program management services); and Marsh & McLennan Capital (insurance industry investment and advisory services). The company also owns Putnam Investments, one of the US's biggest money managers, and Mercer Consulting Group, which provides human resources and management consulting worldwide.